In the 18th century, it was not unusual for a ship to dock at John Shepherd’s landing in the tiny village of Greenwich, New Jersey. The town, located on the Cohansey River about six miles from Delaware Bay, was an official British customs port. But it was not a very busy port town, and its population was small enough to make any vessel’s arrival worthy of conversation. One ship in particular—which arrived sometime in the second week of December 1774—was even more newsworthy because of its cargo. For the past year, the British-American colonies had been resisting England’s efforts to flood their markets with cheap tea from India. The colonists had been forced to pay a tax on tea since 1767—the year the commodity was included on a list of luxury items levied as part of the Townshend Duties. When the Townshend Duties were repealed in 1770, however, the tax on tea continued, causing the product to become the object of many colonial boycotts during the seven years that preceded the dreaded Tea Act of 1773. This spirit of resistance was not lost on the inhabitants of Greenwich. The brig that had just pulled into their port was filled with tea from the East India Company. Upon the tea’s arrival, a group of young Greenwich men—most likely inspired by the previous year’s “Boston Tea Party”—seized the ship’s cargo from the home of a local Tory and burned it in the town square. I first heard about the Greenwich Tea Burning while doing research for a book about Philip Vickers Fithian, a native of the town who wrote about the event in his diary and, according to local lore, was one of the participants.1 I was eager to learn more. As a historian, I thought the tea burning might make a wonderful study of how the American Revolution played out in a place now largely forgotten by history. I found some thorough histories of the tea burning written by local antiquarians. These works were filled with fascinating stories of tea burners’ secret meetings and a comical account of a hesitant participant who stuffed his pantaloons with tea in order to take some home to his family before it was burned. But when I sought documentation to support these stories, I came up empty. Although there were a few pieces of evidence that I could work with, most of the accounts were based largely on traditions passed along from one generation to the next—tales that eventually ended up in history books or pamphlets distributed by the local historical society. After months of frustrated searching, I finally understood that the real story of the Greenwich Tea Burning was more about memory than history. It didn’t matter if I could prove whether the guardians of Greenwich history were right or wrong about the events surrounding the tea burning. Instead, what matters is the way the tea burning has come to shape this community over the years. The Greenwich Tea Burning is just as much a story of the 19th- and 20th-centuries as it is an 18th-century one. To be fully understood, this Revolutionary-Era event must be written about in terms of the way it has been commemorated, celebrated and used as a means of making sense of changing times. With this thought in mind, my first goal was to find out how the Greenwich Tea Burning was remembered in the half-century following American Independence. I had just finished reading Alfred Young’s The Shoemaker and the Tea Party and had discovered that the Boston Tea Party had not become part of New England’s historical consciousness until the 1830s.2 I wondered if the same might be true for the Greenwich Tea Burning. I started my research in America’s Historical Newspapers. If Greenwich and its surrounding communities had commemorated the burning during the early national period then surely it would have been mentioned in local or regional newspapers. From my searches, I learned that the people of Greenwich and the larger Cumberland County region did indeed spend much time and effort between 1780 and 1820 commemorating American independence. 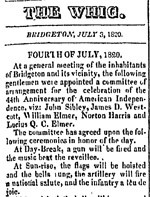 Reports in the Washington Whig, Dunlap American Daily Advertiser, the Gazette of the United States and the Philadelphia Evening Post revealed that the people of Cumberland County held parades, delivered Fourth of July orations and decorated their homes with patriotic symbols to celebrate their connection to the new nation.3 But the Greenwich Tea Burning was not remembered in these celebrations. What Young had concluded about New Englanders’ response to the Boston Tea Party seemed to hold true for the people of Greenwich as well. The absence of any reference to the tea burning in newspaper accounts of patriotic commemorations in the early republic surprised me in light of the event’s present-day significance. Today, residents of Greenwich not only celebrate the tea burning, they often consider it the defining moment of their history. It was obvious that the tea burning had entered into the historical consciousness of the people of Greenwich at some point in the 19th or 20th century. I set out to find when, and how, its memory was recovered. I turned once again to America’s Historical Newspapers. 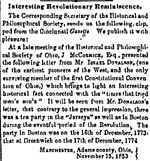 The first reference to the Greenwich Tea Burning I uncovered appeared in an 1853 edition of the Ohio Statesman.4 It was a firsthand account written by Israel Donalson, the only surviving member of the Ohio Constitutional Convention. Donalson—who was born and raised near Greenwich and had moved to Ohio in 1787—not only described the tea burning but also made reference to a book that he claimed was the first to mention it. After a bit more research, this book turned out to be Robert Gibbon Johnson’s An Historical Account of the First Settlement of Salem in West Jersey.5 Donalson was right. As far as I could tell, Johnson’s 1839 book provided the first public acknowledgement of the Greenwich Tea Burning since a Pennsylvania Packet article was published in January 1774. My study of historical memory in Greenwich was off to a fruitful start. I continue to be fascinated with the way in which the Greenwich Tea Burning has been remembered in this South Jersey community. I want to explain, for example, why the tea burning did not become part of the region’s historical consciousness until 1839. America’s Historical Newspapers has already helped me trace the way this event re-emerged as part of the patriotic culture of the community. For example, regional newspapers offer extension coverage of the 1874 centennial of the event and the 1908 erection of a monument to remember those who participated. Without this digital resource, it would have been very difficult to tell the story of the Greenwich Tea Burning; and without the story, we would have missed out on a slice of local history that illuminates the way Americans have remembered and celebrated their revolutionary past. 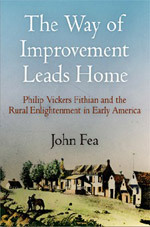 1 John Fea, The Way of Improvement Leads Home: Philip Vickers Fithian and the Rural Enlightenment in Early America (Philadelphia: University of Pennsylvania Press, 2008). 2 Alfred F. Young, The Shoemaker and the Tea Party: Memory and the American Revolution (Boston: Beacon Press, 1999). 3 See, for example, Dunlap American Daily Advertiser, July 17, 1795; The Gazette of the United States, July 24, 1798; Washington Whig, June 19, 1820, June 26, 1820, July 3, 1820. 4 Ohio Statesman, December 16, 1853. 5 Robert Gibbon Johnson, An Historical Account of the First Settlement of Salem in West Jersey (Salem, NJ: Publishers, 1839). John Fea teaches American history at Messiah College in Grantham, PA. He is the author of The Way of Improvement Leads Home: Philip Vickers Fithian and the Rural Enlightenment in Early America (University of Pennsylvania Press, 2008) and is currently completing a book entitled The Greenwich Tea Burning: History and Memory in a New Jersey Town.